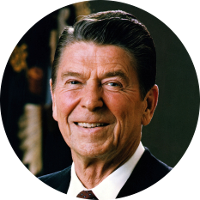 Ronald Reagan was the 40th President of the United States, the 33rd Governor of California, and a former movie actor. He is probably best remembered for his role as George “The Gipper” Gipp in the film Knute Rockne, All American and for his co-starring role in Bedtime for Bonzo. In 1957, Ronald Reagan starred in the movie Hellcats of the Navy which is the only film him and his wife, actress Nancy Davis, appeared in together. Ronald Reagan was twice elected as the President of the Screen Actors Guild where he helped to root out Communists. On March 30, 1981, only two months after being sworn in as President, Ronald Reagan was shot in an attempted assassination by John Hinckley Jr. Hinckley’s motivation is said to have been some sort of deranged attempt to impress actress Jodie Foster. Although President Reagan would recover from his wounds and go on to serve two terms as President, his press secretary James Brady would die from his wounds 33 years later in 2014. Brady’s death would be ruled a homicide caused by his gunshot would from Hinckley. John Hinckley was declared not guilty by reason of insanity and remained locked up in a psychiatric facility until September 2016 when he was released into the care of his elderly mother.